Google+ will be center of activity with every other Google service being integrated to Google+ profile. Now your Google profiles are Google+ profiles and you can easily display reference to your Google+ profile on your blog or website. This can be done using official Google+ profile button. Just select the button size and paste the generated code to show your Google+ profile button. Further, your website users can click through Google+ button and interact with you on Google+ service. 1. First you need to know your Google+ profile URL. Open plus.google.com and login into your account. Then right click on your profile name at top left and click ‘Copy link address’. Alternatively, you can click your profile photo to open your custom profile page and then copy your profile URL in the address bar like https://plus.google.com/14650… (do not copy “/posts” at the end of this URL). 2. Open Google Profile button webpage for generating the required code for the button. 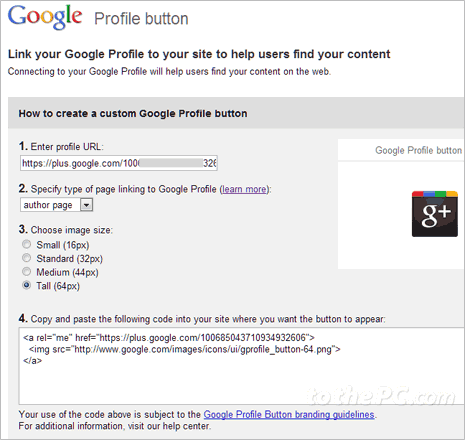 This online web form allows you to automatically get code for custom Google+ profile button. Paste your Google+ profile URL in the “Enter profile URL” box. 3. Then “Specify type of page linking to Google Profile among: author or content page options. A content page can be any piece of content with an author: a news article, blog post. While an author page is a page about a specific author, on the same domain as the content page. 4. Click to select button size of g+ image among: Small (16px), Standard (32px), Medium (44px) and Tall (64px). 5. Once you select above options, you will get customized code at the bottom. 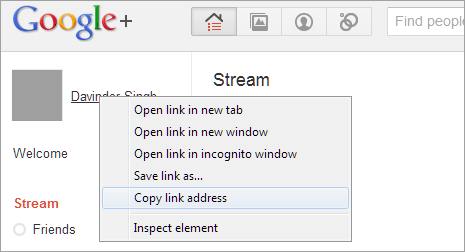 Copy it and paste in your blog sidebar for users to see link to your Google+ profile. They can easily connect with you on Google+ once you have this button displayed on the blog. It is recommended to display this button on blog sidebar or footer or header – as the default Google+ Plus button is shown below or above post content for users to +1 your blog posts, articles and stories.